Lexington Herald-Leader video by Pablo Alcala of a fight demonstration presented by the cast and crew of UK's production of "She Kills Monsters." 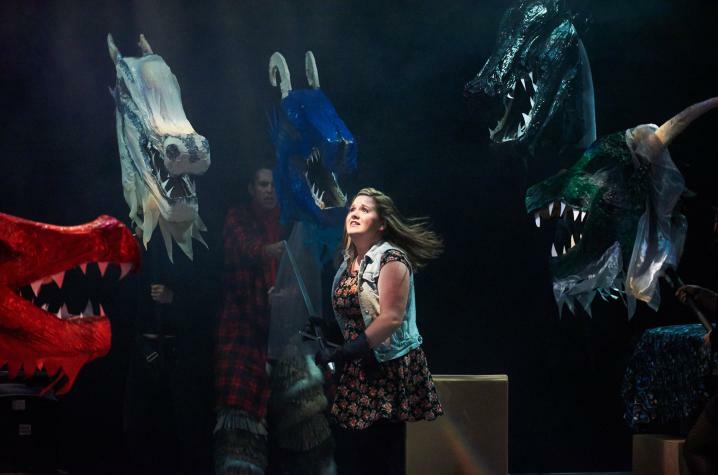 LEXINGTON, Ky. (Oct. 27, 2016) — When the protagonist, Agnes, in University of Kentucky Department of Theatre and Dance's production of "She Kills Monsters" begins waging war on monsters this weekend, she has alumnus Andrew Dylan Ray to thank for her winning fighting form. 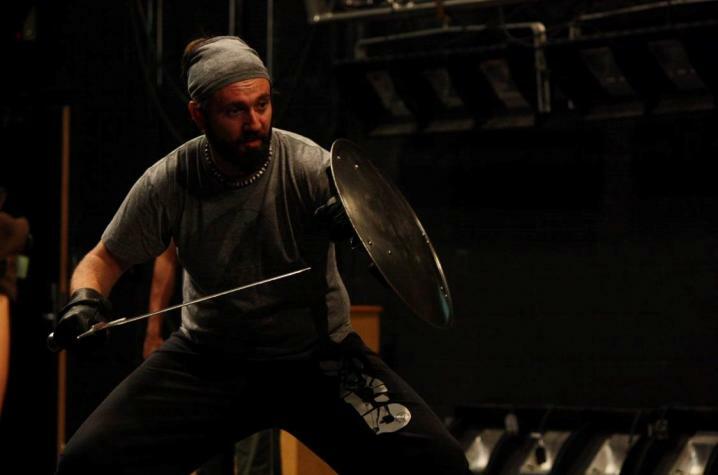 Since fall of 2012, Ray has been returning to Lexington each semester from his home in Shreveport, Louisiana, to train UK students in stage combat. The actor, director, motion capture performer in the video game industry, and 2003 UK theatre graduate is one of only 116 certified stage combat instructors with the Society of American Fight Directors in the U.S. and is the main reason UK theatre students have a fighting edge in the arts. "We have developed the most successful stage combat program in the country here with UK Theatre," said Ray, who can teach certification courses in eight different weapons for stage and screen. "Last year we graduated a group of seniors who have moved to do this type of work all over the country." 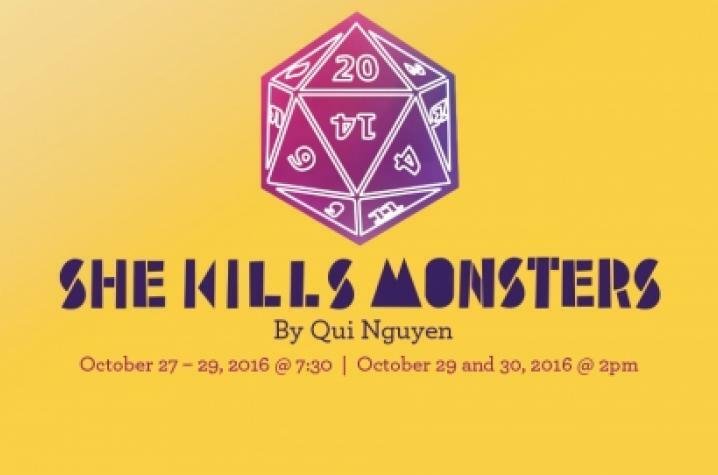 This fall, Ray has been hard at work preparing the cast of "She Kills Monsters" to bring the Qui Nguyen story to life on stage at Guignol Theatre. The play follows an average young woman, Agnes, who after her teenage sister dies in a tragic accident, discovers the sibling's "Dungeons and Dragons" notebook and sets off on an extraordinary adventure into the fantasy world of RPGs (role-playing games). Ray was a great match to serve as assistant director and fight director of the UK production of "She Kills Monsters," as much of the cast has little stage combat experience yet and benefited from the expertise he was able to bring to the action in the play. "The group in 'She Kills Monsters' are really doing most of this stuff for the first time and some of them haven’t taken my class yet. They are learning on the fly," Ray said. "The fights in this are open for a lot of interpretation and we have really pushed them to make these fights fun and exciting, but be performed at a level where the audience buys into the world and begins to believe, while never sacrificing safety and technique to do so." Many times stage combat can be shorted in the rehearsal process of stage productions, which often is easily detected by more and more savvy theatre audiences. "Fights are typically given the least amount of time in rehearsal, and a lot of the time are just thrown together by someone with no qualifications or real skill in this art form," Ray said. "What you get are bad, sloppy and dangerous moments on stage that take the audience out of the moment rather than draw them in." Even as Ray kept a busy work schedule flying back and forth to Kentucky to work with his cast, he has truly enjoyed the opportunity to teach his actors a new set of skills that will benefit not only this weekend's performances but also the cast's future careers. "The thing I’ve loved the most about this show is I’ve been here every night, and the students are allowed to explore these fights in an environment they feel safe in. This work is about trust and developing partnering skills." The students appearing in UK's "She Kills Monsters" are: Lyndsey Jayne Pennington as Narrator/Farrah; Kelsey Reese as Tilly Evans; Sloan Gilbert as Agnes Evans; David Cole as Chuck; Joshua Cox as Miles; Tamia Fair as Lilith; Cameryn Zupon as Kaliope; Henry Harris III as Orcus; Tucker Keel as Steve; Madeline Williamson as Vera; Raiffa Syamil as Evil Tina; and Allyson Ledford as Evil Gabbi. Isaac Hines-William, Austin Lytle, Amy Pan and Brea Rollston will lend their talents to the play as members of the ensemble. "She Kills Monsters" will storm the Guignol Theatre stage 7:30 p.m. Thursday-Saturday, Oct. 27-29, and 2 p.m. Saturday and Sunday, Oct. 29 and 30. Tickets for the production are $15 for general admission and $10 for UK students with a valid ID through the Singletary Center box office. To purchase tickets, contact the box office at 859-257-4929, visit online at www.scfatickets.com or purchase in person during operating hours. The UK Department of Theatre and Dance at UK College of Fine Arts has played an active role in the performance scene in Central Kentucky for more than 100 years. Students in the program get hands-on training and one-on-one mentorship from the renowned professional theatre faculty. The liberal arts focus of their bachelor's degree program is coupled with ongoing career counseling to ensure a successful transition from campus to professional life.